Owners Jacquelyn Penwell and Courtney Rayburn, along with Highland County Chamber of Commerce representatives and others, are pictured Saturday at the grand opening of AnnMarie Boutique in Greenfield. 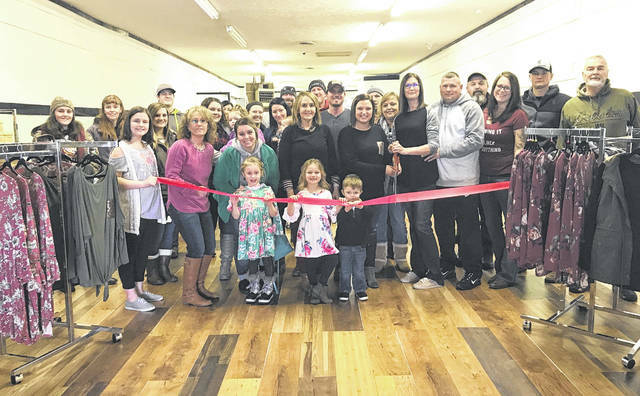 The Highland County Chamber of Commerce welcomed its newest member, AnnMarie Boutique, with a ribbon-cutting at its grand 0pening Saturday, Jan. 12. Those who braved the snow were the first to see the new storefront at 319 Jefferson St., Greenfield. Grand opening attendees were entered into drawings for giveaways throughout the day and the first 10 customers received 10 percent off their purchase. Owners Jacquelyn Penwell and Cortney Rayburn are not only business partners, but aunt and niece. They share their middle names with their daughters, so why not have the shop represent them, too? “We are just two small town girls turning our dreams into reality. We look forward to this journey we are about to embark on and someday handing the reins over to our daughters, Alyssa Marie and Gracelyn Ann,” the owners said in a news release. Their goal is to provide excellent customer service while meeting the needs of the customers by offering stylish clothes at affordable prices. The shop currently carries a small selection of shoes, little girl’s clothing sizes 2T to 8/9 and women’s clothing sizes small to 3x. “We hope to see our boutique grow and succeed in this small town. With that being said, we may later expand our family business to surrounding counties,” the owners said. Current store hours are Thursday 12:30 p.m. to 5 p.m., Friday 11 a.m. to 6 p.m., Saturday 11 a.m. to 5 p.m. and Sunday 1-5 p.m. You can also check their Facebook page for pictures of new inventory, online ordering, and general information about the boutique. https://www.timesgazette.com/wp-content/uploads/sites/33/2019/01/web1_AnnMarie-pic.jpgOwners Jacquelyn Penwell and Courtney Rayburn, along with Highland County Chamber of Commerce representatives and others, are pictured Saturday at the grand opening of AnnMarie Boutique in Greenfield.